Smith moved into management at the age of 30 when he became the manager of Stenhousemuir in 1969, and 5 years later he took over at Stirling Albion where he remained for 12 years, guiding them to the Second Division title in 1977. In 1986 he became St Mirren manager, and in his first season his side defeated Dundee United 1-0 in the 1987 Scottish Cup Final to win St Mirren's first major trophy in 28 years. A year later he moved to Aberdeen to take on the role as co-manager along with Jocky Scott, and in their second season they won the domestic Cup double, winning both the League Cup and the Scottish Cup. During his time at Pittodrie, Aberdeen finished as runners-up in the Premier Division in three consecutive seasons, but he became the first ever Aberdeen manager to be sacked after a bad run of form in 1992. He would go on to have a spell as Clyde manager, and became heavily involved with the Scotland International set up, managing the under-18 and under-21 sides until 2002. When Paul Sturrock resigned as United manager, chairman Jim McLean turned to his friend Smith to step in, and he led the team through a torrid time at the Club, helping United survive a relegation battle against his old club St Mirren in 2001. 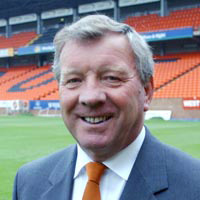 After an inconsistent 2001/02 season, United started the 2002/03 season badly, and when Eddie Thompson bought a controlling interest in the Club in 2002, one of his first steps was to replace Smith as manager.